Santa Justa Lift was built in 1902 by Raul Mésnier, Gustave Eiffel’s apprentice: hence the vaguely familiar neo-Gothic wrought iron stylings of Lisbon’s only vertical street lift. There’s always a long queue to get to the top for sweeping views of the city, so go as soon as Santa Justa Lift opens. If you’re visiting after 9:00am, save time and money by entering the platform from the top (behind Convento do Carmo via Bellalisa restaurant) and save €3.50 off the €5 fee by paying just €1.50 to access the viewing platform. Thrills and spills aside, the NO. 28 TRAM offers one of the best tours of the capital: passing through the popular tourist districts of Estrela, Alfama, and Baixa. The experience is as local and authentic as it gets - between 10:00am to 6:00pm the trams are standing room only, so go before and after rush hour(s) to snag a seat. I’d suggest sitting right at the back, so you not only enjoy a breeze from the rear window but also enjoy the view as the ascends the city’s many steep roads. A single ticket purchased onboard is €2.90. Instead, purchase the 24-hour public transport ticket (€6.15) from a metro station; which includes all metro, tram,and bus services; as well as Elevador de Santa Justa, the Elevador da Glória and multiple rides on the NO. 28 TRAM route. No doubt you’ve worked up quite an appetite after the adventure that is the No. 28 tram. Wherever you get off, hop into a tuk tuk for another thrilling ride down to the district of Belem, where the city’s most famous pastry shop awaits. Since 1837, PASTÉIS DE BELÉM has been serving their signature Pastel de Nata (Portuguese egg tart pastry - itself an icon of Portugal) with the same secret, ancient recipe from the nearby Jeronimos Monastery. Don’t be intimidated by the huge queue of people looking to buy their pastries - that's the "takeaway line". Skip it and head to the other quick-moving queue for one of the 400 seats in the cafe of PASTÉIS DE BELÉM. Over a cup of coffee, savour the cafe’s many pastries especially the obligatory Pastel de Nata - warm, buttery, perfectly flaky, traditional, hand-made tarts of egg pastry that’s just the right texture of gooey and creamy. While most of your fellow tourists are otherwise elsewhere at lunch, take advantage of their absence and pop next door to JERÓNIMOS MONASTERY. This 16th century UNESCO-listed monastery, one of the 3 great icons of Belém (the other 2 being PASTÉIS DE BELÉM and BELEM TOWER), is quite simply (and literally) out of this world. While JERÓNIMOS MONASTERY was once home to monks of the Order of St Jerome, the aesthetic is far from ascetic. Every inch drips with detail: columns, scalloped arches, and turrets of honey-coloured stone seem to come alive with organic shapes and themes - from leaves, vines, gargoyles and other fantastic beats as they climb up to the ceilings and towards the Manueline cloisters - all while casting a soft golden glow that seems to illuminate the monastery with the light of God. Keep an eye out for notable citizens interred here, including Fernando Pessoa - possibly the country’s greatest poet and philosopher, including the existential masterpiece The Book of Disquiet. If you’re lucky, you’ll catch a choir performance in one of the chambers - the acoustics are positively spine-tingling. As is JERÓNIMOS MONASTERY, BELEM TOWER is a 16th century UNESCO World Heritage Site and likewise, unmissable. This fortified limestone tower played a significant role in Portuguese maritime history as part of a defence system at the mouth of the Tagus river (like an enormous chess piece, if you will) and a ceremonial gateway to Lisbon. It’s the icon of the Portuguese Age of Discoveries, and this is reflected in its design - while BELEM TOWER is a prominent example of the Portuguese Manueline style, it also incorporates other architectural styles, namely Moorish influences in the arched windows, balconies, and the ribbed cupolas of the watchtowers. If you’re so inclined, hold your breath and climb the narrow spiral staircase to the tower for sublime views over Belém and the river. Claustrophobes (yours truly included) might prefer to just take in the view from the river bank - BELEM TOWER is no less impressive from the outside, in fact; much of its allure lies in the way it seems to spring forth from the water like a silent stone sentinel. The AZULEJO MUSEUM (MUSEU NACIONAL DE AZULEJO - MNAz for short) may seem a little off the beaten track, but it is not to be overlooked. The small, almost hidden entrance to the MNAz belies its collection of this traditional Portuguese art - covering the entire azulejo (traditional Portueguese hand-painted tile) spectrum like a blue & white rainbow of sorts. Every kind of porcelain and tile motif you can think of is here: enormous 2-storey tall altar pieces, foreign patterns from as far as Goa to as near as the Ottoman empire, rustic scenes of farm life to aristocratic scenes of lords and ladies. There’s even a breathtaking baroque chapel dripping in gold, and a cafe that opens into a verdant, vine-covered courtyard with a fountain. Even the building that houses the MNAz is a beauty - a mazelike 16th century convent with soaring ceilings, arches, and walkways that further add to the gravitas of the museum’s impressive, all-encompassing collection. It’s all too easy to wander and get lost for a good couple of hours, and the fact that the MNAz is free to visit makes this even more of a national treasure. The only flaw I can find with the MNAz is that they - as far as I know - haven’t hosted any evening events with the pun-tastic name “A Night Out on the Tiles”. Ahem. 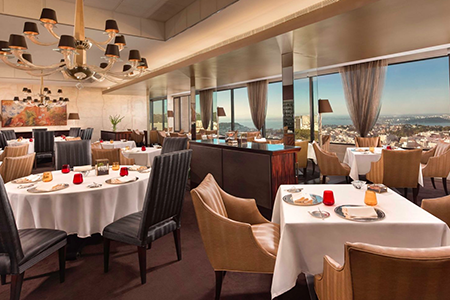 Supper would be of course at PANORAMA RESTAURANT, which is conveniently located on the top floor of the hotel I stayed at, Sheraton Lisboa Hotel & Spa. You know by now that I am a Starwood Preferred Guest and that I am partial to Sheraton Hotels. Happily, PANORAMA RESTAURANT did not disappoint. 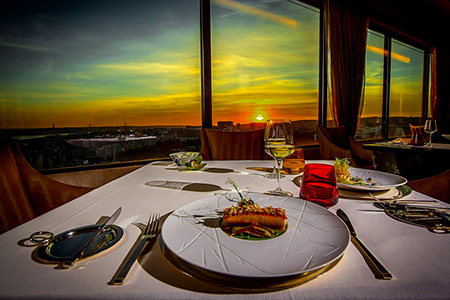 More than just “Dining from Lisbon's Highest View”, PANORAMA RESTAURANT was an absolute experience - traditional Portuguese cuisine with unexpected twists and cheeky presentation, in a sophisticated atmosphere with breathtaking views of the city. I plumped for the North Tasting Menu (beause the other option was the South Tasting Menu and I didn’t want to answer “How was dinner?” with “It went South...”). The artistry and presentation is as refined as you’d expect from the worlds’ best fine-dining restaurants (such as the Trio of Snacks that aren’t what they quite seem to be) while the portions were unusually generous - excluding my many, many courses; many other “surprises” were presented, each of them a separate additional course with at least 3 small dishes. My favourites were the rissol cake (a kind of deep-fried croquette) with cozido (traditional Portuguese stew), mushroom risotto, & asparagus; and the gazpacho with octopus (self-explanatory). A chickpea mousse disguised as “chilis” on a bed of seeds, “tomato” cod mousse potato purée with eel, and a “sugar-coated sweet” that’s in fact meat with a chewy, almost gelatinous texture. 9:00PM...and beyond? Lisbonites have always enjoyed staying up late, but Summer is truly the best time to make the most of the long days. The streets of BAIRRO ALTO are alive with the sound of music. It’s the scene of Lisbon’s social heart, where the locals take to the bars before continuing to socialise on the streets and on Praça Luís de Camões, the main plaza. For a calm and quiet walk, take a stroll through the prosperous district of ESTRELA. Admire the Basílica da Estrela with its ornate Baroque facade, and opposite, Jardim da ESTRELA, a popular park with Portuguese families for a place to relax after a long day. ALFAMA is one of the last bastions of central Lisbon to resist gentrification. A stroll down the steep, narrow, cobblestoned lanes of residential houses allows a glimpse of the more traditional side of Lisbon, with a distinct village atmosphere.